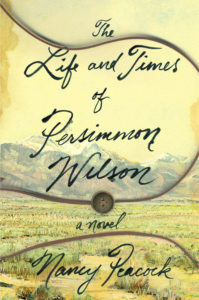 In 2013 Nancy Peacock self-published her historical novel, The Life and Times of Persimmon Wilson. The story follows the journey of Persimmon Wilson (Persy) from his enslavement on a sugar plantation to his assimilation with a band of Comanche Indians in Texas. Throughout his journey, Persy loves deeply and fights strongly, ultimately killing his former master and being sentenced to hang for the act. In 2015 the book won the 22nd Annual Writer’s Digest Award for Best Self Published Book, which led to its purchase by Atria Press. In January 2017 The Life and Times of Persimmon Wilson will experience its second launch. From Nancy: As many of you know, writing a book takes years, and publication can feel like a flash in the pan. Please know that throughout the years, whether they are years of writing or the year of publishing, I appreciate your help and support. I always try to give to my community, not just with stories but with free writing classes, and daily tidbits and musings on writing and creativity on my Facebook page. If you can, please attend one of my readings listed in the calendar. If you cannot attend a reading, please buy the book if you can and feel free to pass it around. A book should never be read by only person per copy. Books are for sharing, revisiting, giving, and loving. Talk about it, put a hold on it in the library, and if you see it in the bookstore, be a sneak and turn it face out on the shelf for me. And please know that all efforts to support any writer or artist benefit every writer and every artist, as well as the world at large. January 29, 2017 Sunday 3:00 to 5:00 (Doors open at 2:00 p.m.) Bookmark’s Moveable Feast, Wake Forest Biotech Place, 675 Patterson Avenue, Winston Salem, NC – Speed dating for writers and bookclubs. Come watch the epic struggle!